in the wake of widespread questioning of the April 4 alleged sarin attack, I've seen a sentiment aired in response that the critics are heartless conspiracy theorists, exploiting the suffering of the innocent to exculpate a dictator, blaming the victims for their own deaths, or accusing the victims of faking it, like hired actors. In some cases, that may be - some of the critics might be, or act like, assholes who flippantly question every little thing just for attention. But these questions need to be raised, because we're almost certainly not getting the real story from the approved anti-government activist sources. And for my part anyway, I try to accept everything I can, and only question what really deserves it. I don't think the event was made-up. I think there was a real and deadly event, that was vastly different than reported. The story told is based on some reality, but with details added, like a regime jet dropping sarin. I'm pretty sure that never happened. But there's something real here to investigate. I'm sure the three kids hacked in the head or neck by local terrorists and included are real murder victims, not fakers (see here). I suspect it's over 100 killed as they say (and probably just over - I hear and suspect it's 103), including the reported 43 children. I suspect gas killed most of them, but primarily not sarin, while others were killed with blades, and all were killed by terrorists who have both blades and various poisonous gasses in their possession. I'm not blaming the victims in any of the suspected 103 fatal cases. But I have no problem blaming actors helping Islamists launder that massacre, as some of the victims we see probably are. Deciding who's who is tricky. I don't plan on doing much of that, but I'll call out two at least, and lay some reasons for doubting others. As some (like Anders at New.Euro-Med.dk) have pointed out, at least one of the children shown in the famous 9 dead kids in a truck video is not dead. The older girl in the bottom row at first has both eyes closed and appears dead. The cameraman brushes her face just as he pans onto her (is that the signal for 'you're on camera now, so don't move'?) He shows her face, looking dead with eyes closed (first frames), pans left, then pans back, and her right eye is open (last frame). The relevance of the different angles could be debated, but either way, we can see in at first the two eyes match for degree op openness, and in the other case, the right eye is clearly more open than the left. In fact it seems to be starting to open just as he starts panning to the left (third frame). She might also crack a smile just as he pans up and a patch of sunlight makes it less than certain. I'm not looking to argue fakery here, where mainly I suspect real mass murder. Maybe this girl was just declared dead too early? Maybe, but the signs point more to fakery. The reason for this stupid move would be unclear. Presumably, this is an unusual tack-on case, the cameraman's daughter maybe. We have one impostor among arrays of the clearly dead, but I suspect there are few if any others, and the dead people are primarily genuine. The Sarin Was Faked - Who Helped? Other among the living victims, mostly fighting age males, make a show of being random locals, wiggling or shaking in the mud, sometimes with foam on their faces. Many or most of these could be actors, while some or maybe all of them could also be real - I'm no expert. But at the least, I suspect none of them was poisoned with the blamed nerve gas, sarin. As noted, rescue workers handle the patients without any protective gear for the skin, even gloves (sarin spreads on contact and is extremely potent - a gas mask or surgical mask, like some have, would protect the face, but that simply isn't adequate to handle real sarin victims). It's said some workers suffered exposure (the White House claims to believe this and uses it as evidence to decide on sarin). But we don't see that on video among those handling the supposed victims, so the claim is likely untrue and at best unproven. - Misosis actually has several causes, some of which are alternate poisons of some interest, like opiates. But misos is the M in the standard sarin symptom acronym SLUDGEM. The other letters stand for Salivation (drooling), Lachrymation (tears), Urination, Diarrhea/defecation, Gastrointestinal distress, and Emesis (vomiting). (Wikipedia, SLUDGE syndrome). The excretory systems go as haywire as everything else, with these parts being visible on the outside. Yet, I don't think I've ever seen this with any of the alleged Syria CW attacks. In those against government soldiers or government-secured areas, the victims aren't shown. In those against rebel areas, they are, and no one displays the SLUDE syndrome. The same applies here: many victims are stripped to underwear, and as far as we can see, they haven't soiled themselves. They don't seem to vomit that we see, etc. - Sarin also tends to cause cyanosis (a deepening blue shade to the skin, especially visible in the lips and beds of the fingernails.) This isn't universally, but common, and it's not exclusive; it has many other causes - but it should appear. Yet we see little if any cyanosis, and in fact lots of rosy cheeks (see an example below). It's hard to say if that excess red is just from being cold or might be a poison clue (pointing to hydrogen cyanide or caron monoxide, perhaps). But either way, it argues against sarin. 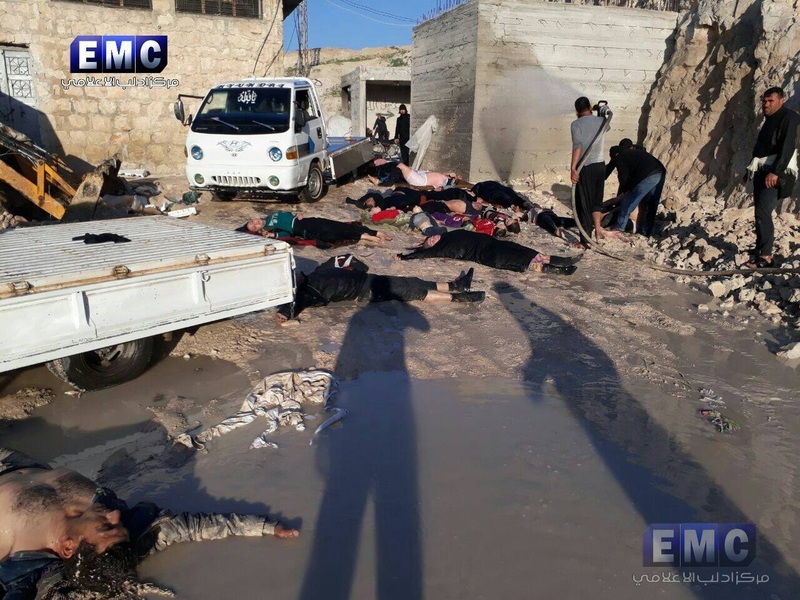 So I don't buy people exposed to sarin were trucked to this place, at the cave hospital on the east edge of Khan Sheykhoun, and were still laying in the mud and wiggling an hour or so later. (They say the attack was around 6:30-6:45 am, and these scenes seem to be a bit later, mostly between 7 and 8:30, by sunlight angles - see ACLOS section with handy list of shadow-length to time translations one can use to visually time a scene. The scene at right is probably around 8:00). Again, this doesn't prove that everyone here is faking, just that - at least generally - it's not what activists said it was. There may be some real sarin cases in there somewhere, but most are either fakers, and people genuinely poisoned with something else. for example: a very clean-shaven young guy in clothing with English lettering - is this how he usually goeas around in this Islamist-run area, or was he just dressed up for the cameras? His distinct blue shirt seems to say "ATHL.(etic?) PERFOMANCE," but he gives a pathetic performance. First, he's seen in an early White Helmets video (see first seconds). I didn't time the video yet, but it's early - direct sunlight is barely entering this dug-in area, and this east corner is all in shadow. Ostensibly, he was sleeping at home when he was gassed with sarin, was rescued, dressed in street clothes and his jacket, and then was driven here and partly stripped (they took off his jacket). Now, some time afterwards, he's seen "convulsing." In fact, it seems to get a bit more severe as he sees the camera approaching. But If he was hit with sarin, and survived it long enough to get here, he'd probably be recovering now, just lethargic and drained. But he's still gripped by a mellow, sustainable sort of wiggly "seizures" we see? Not buying it. I think he showed up to his job this day dressed and with his jacket, prepared to earn his pay. He's sort-of gulping for air like a fish, which seems realistic for something that clogs the airways (like sarin would), but that also allows for such complex actions (sarin makes anything coherent like gulping or breathing difficult as all nerve ending go hyperactive at once). A red-faced boy here is doing the same, and it seems real in his case (0:10 in this video). But the pathetic faker is doing it all through his nose, as you can see above, with his mouth closed. In fact it's clenched shut, lips in tight, in a 'not-kissing-grandma' manner, or making a show of trying to not say something. Besides the fact that this too is probably impossible to do under sarin's effect, this makes no sense as a way to increase oxygen intake - the mouth brings in far more oxygen than the nose. I think it's pretty clear this guy has no real problem with his breathing. Maybe his mouth is locked shut to keep in his one load of "foam" until the good camera arrived. 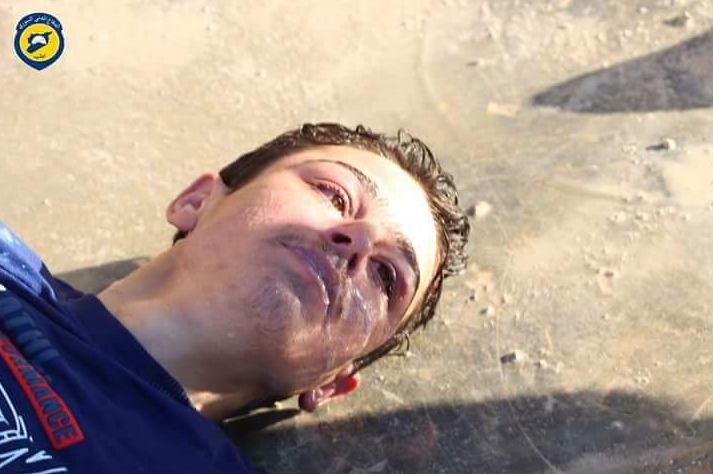 It's the same guy seen in a White Helmets quality photo, with somewhat bubbly liquid running out of his re-closed mouth. This is more realistic, actually, than the usual shaving-cream style "foaming at the mouth" effect. But victims don't usually hold it in until the right camera appears. This image is from some minutes later; he's in the same spot, but sunlight has broken across his face, and he's been hosed off since. Still, the alleged sarin seems in no hurry to kill this guy or let him go. As long as the cameras are running, it keeps racking his system, making him wiggle and causing one batch of foamy stuff he'd need to spit up at the right time. Another view shows he's had his shirt pulled up and pants pulled down to show clean whit underwear to underline that he was never exposed to sarin. 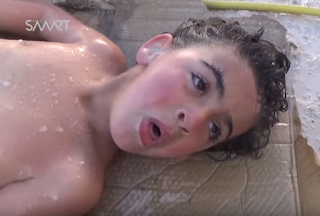 But he did lay there faking it for some time - he's just as patient as this alleged sarin. Him, the alleged gas, and the cameras ...what a team! There seems to be a significant portion of fakery in this case. Nonetheless, the entire thing isn't just made up. People did surely die, I suspect over 100 as they say (and probably just over I hear and suspect 103), including the reported 43 children. There's nothing fake about the real core massacre here, just in the story it was packed in, and some of the people brought in to act out that story. The true story beneath that matters, and deserves a serious, impartial investigation, looking at the actual facts with blinders removed. Just an observation to do with 'foam', at Al Salam treatment seems to have revolved around many bottles of Pepsi. They also seem to have had 7Up that day.